The PEUGEOT 2008 DKR: the Jujuy-Jujuy loop. 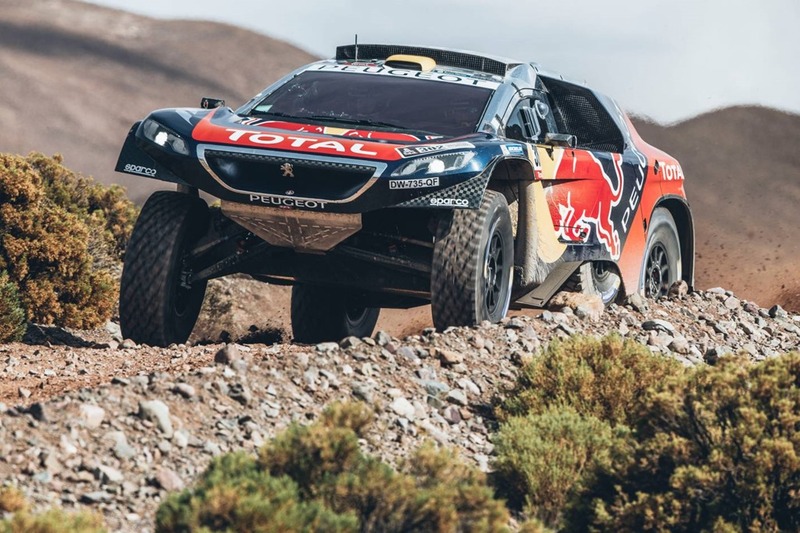 The PEUGEOT 2008 DKR confirm their potential by achieving a one-two-three finish in the first part of the Marathon stage, the Jujuy-Jujuy loop. The Peugeot 2008 DKRs were classified first, second and third on a Dakar stage for the first time, on today’s loop that went around Jujuy. All four cars have also finished leg four in the top five overall. They returned straight to parc ferme under the marathon stage regulations, where no service from the mechanics or the crew is allowed. Tomorrow, they head towards Bolivia for leg 5 of the rally. Stéphane Peterhansel and Jean-Paul Cottret took their first Dakar stage win with Peugeot. They fought closely with Carlos Sainz-Lucas Cruz and Sébastien Loeb-Daniel Elena throughout the stage for the honours. By the end of it, the three Peugeot crews were covered by just 30 seconds. Carlos Sainz and Lucas Cruz were in the stage lead by the first waypoint but lost 3min02sec just before the 53-kilometre mark with a left-rear puncture. The number 303 crew then picked up their pace to make the time back, and demonstrate stage-winning pace by waypoint nine (out of 10). Cyril Despres and David Castera complete Peugeot’s excellent performance today by getting into the top five: one of the best surprises from the early stages of this rally. In the overall classification, Sébastien Loeb continues to lead from Stéphane Peterhansel.